RF Demodulators! This is a product which has dried up in the marketplace almost overnight. Up to the plate first is a 100% internal solution. The board is a small (but larger than our RF Upgrade Kit board) 2.5" x 3" circuit board with a DSP chip and associated hardware to do RF Demodulation. 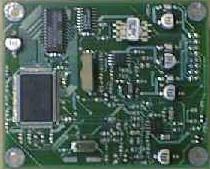 This is an OEM board designed and produced by a company for several "big-name" Audio/Video hardware companies. They bought this board and stuck it in an external box with power supply and put their names on them. The installation difference would be that you'd route the output of our AC-3 RF upgrade module over to the input of this circuit and then on to the RCA jack at the back of the player. The RCA jack on the back of the LD player would then have a straight Dolby Digital AC-3 *DIGITAL* signal on it and NOT an RF modulated signal. You could then connect it to the same inputs on your receiver a DVD player or satellite dish receiver or other DD capable component connects to. An added advantage of the internal solution is no extra wires or power cubes! Note: Since the board is a bit larger some players will have space constraint issues. If we think it will be tough to install the board inside a certain model of player we'll warn you beforehand. Coming soon is an external stand-aolne RF Demodulator solution. We're working on the case and power supply issues now and should update this info soon. PS. Around $200 has been a common recent price on an external RF Demod. Drop us an email and let us know what you think. If you're interested in purchasing either configuration and want to be informed when we've got them ready to go, let us know as well.